I was really excited for Halloween this year, and not just for the usual reasons. I couldn’t wait for the Kindergarten Halloween Festival and, finally, a chance to spy. It’s a tradition at the girls’ school. (The festival, not the spying.) Every Halloween, all the kindergarteners — and only the kindergarteners — parade through the school in their costumes. Cutest thing ever. Then they gather in the cafeteria for the morning, where sevearl stations are set up with carnival-like activities: story telling, cookie decorating, pin-the-smile-on-the-jack o’ lantern. That kind of thing. I signed up immediately as a helper for the morning. It was my first real look at Sophie in action, amongst her peers. I’ve banned myself from her classroom, which kills me. Not that I have so many hours to volunteer, but I’ve always managed some lurking time in Annabelle’s classroom. It’s good for her to see me around, and even better for me to see what’s up in the space my kid occupies for such a big hunk of her life. Last year when Annabelle was in first grade I got an eyeful of just how much time some teachers spend texting (hey, it was a new boyfriend, cut her some slack) and got to organize someone else’s supply closet — which for some reason is infinitely easier than organizing any of my own crap. This year I’m in absolute awe of Mrs. Z and her Smart Board (google it if you’ve never heard of one — amazing) and her ability to keep just enough control over a group of 7 year olds to get them to work without feeling like they’re working. And while I’m grading homework, I get to keep tabs on the kids’ social lives. I admit that’s the best part. But I’ve never gotten to hang with Sophie’s class. In pre-school, parents were pretty much banned from the classroom. At first I was really upset, but Sophie’s wonderful teacher promised she’d be a different kid with Mommy around. “We’ll videotape her if you want,” she said. I was allowed to come at Hanukkah, and the teacher was right: Sophie spent the whole time showing off for me and disrupting the group. The Kindergarten Festival went well, although I got stuck at the math station — not my strong suit. OK, I admit it’s not like it was algebra. The kids made patterns with construction paper pumpkins, ghosts and bats. Still, it was stressful, and partly because I was afraid of what I would see. Would the other kids leave Sophie in the dust? Let’s say I was pleasantly horrified. I’d figured she’d emerge as the slowest, but as I got to see each kid complete (or not) an activity that required a bit of concentration and effort, I realized that Sophie’s hardly at the bottom of the pile. I’m not deluding myself, trust me. Well, maybe I am, but not entirely. Last week the “Clifford Journal” came home — the kids are allowed to take home a stuffed Clifford the Big Red Dog to play with, then asked to write about the “visit” in the journal. 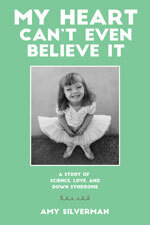 My eyes welled up as I flipped through the book. 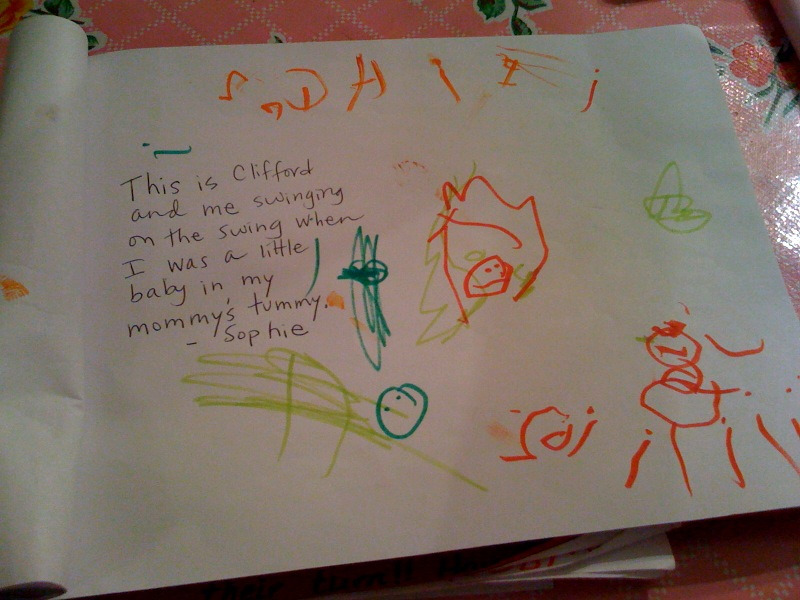 Many kids had drawn fairly intricate portraits of Clifford engaged in activities around the house, along with several well-constructed sentences describing the visit. But even that wouldn’t have worked with Sophie. She still has trouble forming the letters to more than her name, dictated or not. So I was nervous as I set out glue sticks and paper cut outs. And yeah, I saw my share of whiz kids. But what surprised me was how many kids were completely unable to do the simple task at my station. Although patterns are a big thing in kindergarten — the precursor to math and all that, something that has no doubt been covered to death by three months into the school year – some children stared blankly when faced with the task. A few couldn’t figure out how to rub the glue stick on the back of the paper, or how to get the finished product into the brown bag they were carrying around. I will never, ever teach elementary school. Sophie’s doing just fine in kindergarten. And she looked damn cute in her Cookie Monster costume. Love the picture! I didn’t see her in the parade. I volunteered in 5th grade last week and had to ask the teacher for help because of course, it was math. All the kids were thrilled but I felt like a dope. I knew the answer, just not how to get to it, ha ha. If Sophie ever has a hankering to be Pikachu, we’ve got a great costume she can borrow. Same style as Cookie (who, along with Grover, was always one of my favorites). Previous: Leftover Candy Corn, Anyone? Next: Can People with Down syndrome Vote?